PCH, 500 Bucks Worth Of Rust Edition: Skoda Felicia or Burma Jeep? We were shocked, shocked to learn that the Peugeot 404 Baja racer annihilated the Oval Window Baja Bug in last Friday's Choose Your Eternity poll. It's a new week, however, and we've got new challenges ahead. Let's head on up to Seattle, where the constant rain creates sort of a year-round meat-market singles bar for lonely iron atoms looking to hook up with promiscuous oxygen atoms... and nobody goes home alone! When you've got a vehicle that's been sitting outside in coastal Washington for decade after decade, you figure you ought to be able to get it for a very reasonable price- and you figured right! 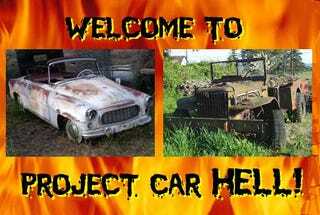 Zeet has earned a PCH Tipster T-shirt by finding us a couple of tantalizingly cool machines sitting in the sodden Pacific Northwest weeds, so let's drive right in to a colder, damper Project Car Hell! PCH, Vintage Baja Racer Edition: Peugeot 404 or 1957 Baja Bug? They made some wonderful cars in Czechoslovakia back in the day, but that darned ol' Iron Curtain kept all but a tiny handful of them from making their way to North America. Still, Skoda took an ill-advised shot at importing Felicias back in the early 60s, which means that you might be able to find an affordable one over here. As a matter of fact, you can get this convertible (go here if the ad disappears) for 500 bucks or best offer. How can you resist? The seller sums up the car quite aptly with this no-punctuation-needed statement: "basket case little rust mostly there what you see is what you get." See, it's mostly there! Just make a few calls to Prague and you'll have the missing stuff faster than a man can turn into a giant cockroach! And don't worry about the running condition of the Skoda engine, because it's already been proven that you can put an Audi V8 in the back! Yeah, there's rust... but how bad can it be? You see quite a few garden-variety WW2 Jeeps just driving around these days, but what if you want one of the super-rare Ford GTB 1-1/2-ton trucks, popularly known as the Burma Jeep? Normally you'd have to pay boo-koo bucks for such a veteran, but we've got a line on this genuine Burma Jeep (go here if the ad disappears) for only $500. We'll readily admit that this truck has something of an oxidation problem, but we know you'll be as relentless as George S. Patton himself when it comes time to replace and/or fabricate the components that are too far gone to fix. Hey, there must be something on this vehicle that won't disintegrate into a cloud of red dust when you stare hard at it! The seller doesn't offer any description (other than "RARE! "), but it looks like an engine is visible behind the grille and you even get the axles. No sweat!